Jeanette L. Hunt is a Certified Document Examiner through the National Association of Document Examiners (NADE) and a State Licensed Instructor by the Texas Commission on Law Enforcement Standards & Education. She is independently tested through the Forensic Testing Program by Collaborative Testing Services, Inc. in Herndon, Virginia. See specialized training. Based in San Antonio, Texas, Ms. Hunt’s experience has not been limited to the Lone Star state. She has expert witness testimony experience in federal, district, and county courts with cases taking her to Florida, Georgia, Missouri, Alabama, Indiana, and California. See types of clients and cases. "Your examination and analysis of the two documents that were purported to be of my client were critical to the defense." 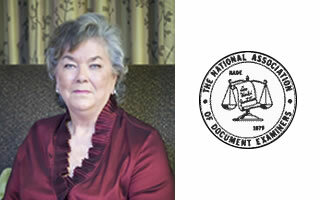 Ms. Hunt has been published in the Journal of the National Association of Document Examiners and The Defender and has presented to numerous groups including the Alamo Area Law Enforcement Academy, National Association of Document Examiners, National Questioned Document Association, Independent Association of Questioned Document Association, Kiwanis, Rotary, Frost Bank, and San Antonio Legal Secretaries Association, among others.